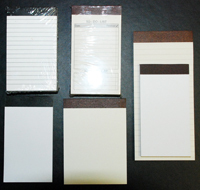 Custom personalized memo pads, scratch pads and leather memo pad holders. 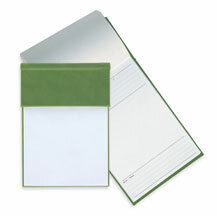 Our notepads and memo pads are printed and manufactured in house. Have your company logo, college mascot or school name digitally printed on each sheet of paper or tape binding. Looking for a new vinyl or leather memo pad holder, we can emboss, foil stamp or screen print your name? We have a variety of sizes and colors available. 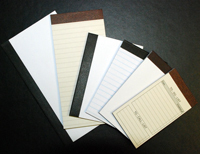 We can perf, tape and/or stitch your scratch or memo pads depending on your needs. Our service, quality and prices are among the best. Call for a quotation on your next memo and scratch pad project. 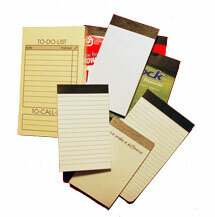 MemoPads.com © 2012 - USA Custom Pad Corp.